// Dessert is always an option. What is dinner without it? Or why not just have dessert instead of dinner? // If you want something, do whatever it takes to make it happen. Even if it means selling your beloved Kate Spade handbag. Thank you, future European Adventure. // Be nice and do nice things for people. // #NoDrama. Consider the other person’s perspective before arguing/blowing up on them. Lately, there’s been too much drama going on in my life. Chill out or get out. // Challenge yourself. Currently, I’m challenging myself to learn as much Italian as possible in the next 6 weeks. It’s incredible what we can do when we set our minds to it! // Make Wine Wednesdays a thing. You won’t regret it. It’s always nice to take time to relax and enjoy good company. // Don’t wait around for things to happen. Go out and make them happen. // Get involved in something you’re passionate about! Whether it’s an organization, hobby, or profession, be fueled by passion! // Make up hashtags for formal and informal events. // I have 12 hours to mope around after a breakup. After those 12 hours, I better find something else to focus my attention on. Why waste time moping around when I could be happy? // Always dress up. I tend to be over dressed 99% of the time. // If people don’t like you that’s their problem, not yours. Be you and be authentic. Don’t let them bring you down. // Never drunk text boys. Just don’t. I always text my girlfriends (or my little brother for some reason…) if I feel the desire to text. // Make your bed every morning. Odd, I know, but since I’ve started doing this, my days are more productive and my mood is boosted! // Take a chance and travel. Even if you can’t afford it. // High heels. High Standards. Pearls Everyday. Now it’s your turn to add on! 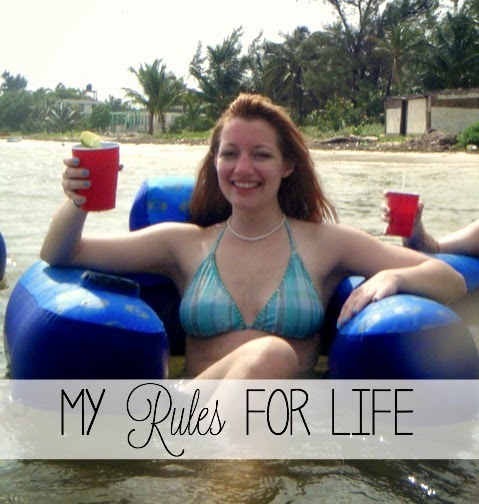 What are your rules for life? *Disclaimer: for rules dealing with alcohol, please drink responsibly. P.S. Here’s an awesome giveaway in honor of Erica’s blogiversary! Happy 1-year Blogiversary to Coming Up Roses!